Hilary’s coaching and strategy consulting work with our Executive Director has been extraordinary and, I think, a key contributor to the success of our strategic planning process and the Board retreat associated with it. We approved the plan months earlier than expected, and I couldn’t be more excited about our next 3-year trajectory. I have found Hilary’s counsel extremely valuable. As a CEO, there are very few people who you can rely on to be a dispassionate sounding board on your decision making. Hilary makes me think about my underlying assumptions and predispositions, but in a very positive and thoughtful way, which has resulted in better decisions. She has also suggested some very practical measures that have improved our reporting to our board. Hilary is a very sharp arrow to have in your decision-making quiver. As a retreat facilitator, Hilary is uniquely skilled at helping a team develop actionable plans for improving performance. She offers the ideal mix of theoretical dexterity and practical insight, allowing teams to both ‘take a step back’ to assess what they’re doing well and prepare real ways of taking steps forward once the retreat is done. No fluff or filler with Hilary — just careful planning, responsive facilitation, and a keen eye for the heart of any issue. I feel like I have developed some great strategies for managing an increasingly complex job. I am amazed by how much progress I made in just a few short months working with Hilary. When we started, I rarely felt good about where I ended each day. Through our coaching work, I feel like I have developed some great strategies for managing an increasingly complex job, and I’m much calmer about everything. In our sessions, I addressed things that had been holding me back for years. Hilary knows when to listen and when to dive in with suggestions, recommendations and assignments. She did not let me get away with the same old way of working. She and I developed some great team leadership strategies, which resulted in significant improvements in the work of my team. Our CEO has remarked on several occasions that she has seen noticeable improvements in the way I contribute to the organization. I addressed things that had been holding me back for years. Hilary was indispensable in helping me think through my professional strengths and priorities as I undertook a major job change. Hilary was adept at helping me clarify the pros/cons of different options so that I could select the best fit. She is quick to get up to speed and thoughtful, yet direct. I have worked with Hilary before in different types of engagements, and I respect her greatly as an advisor and coach. I would call her again without hesitation! I loved her follow up emails on what we had discussed and next actions. My coaching work was an incredible journey for me… It offered me great clarity on my gifts and things I should pay attention to. Hilary was very gifted at asking the right questions and holding me accountable for progress on the things I said matter. Thanks to her energy, time and expertise, I gained a great deal from the experience. I intend to conduct a quarterly coaching “tune-up” with Hilary on an on-going basis. I saw immediate results when I identified what my personal challenges and hot buttons were. In less than a year, I got the promotion I had been seeking. 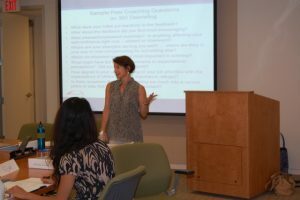 Hilary Joel facilitated the annual staff retreat for our small (16 staff) non-profit. Her instincts for how to conduct a day that was both enjoyable and enriching were uncanny. Her exercises were fun and produced rich take-aways for our staff. Finally, Hilary has an excellent ability to offer insights and advice that participants found very useful. I would recommend her as a facilitator without reservation.